The Quagga (Equus quagga quagga), also Cape Quagga, is a recently extinct zebra. It was one of the six subspecies of plains zebra. It was a yellowish-brown zebra with stripes only on its head, neck and forebody, and looks similar to an Okapi. The Quagga was native to dry grassy plains in the south of the African continent. It was found as far north as the Orange River. It is believed to have separated from other plains zebras between 120,000 and 290,000 years ago. The name Quagga comes from the noise that they made. (kwa-ka-ka) (qua-ga-ga). The Quagga was hunted for food, for their skin and also because farmers did not want it to eat the grass they needed for their sheep and goats. The last wild Quaggas died during a drought in 1878. 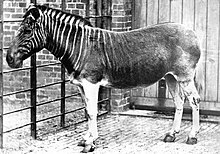 The last captive Quagga died in the Amsterdam Zoo on 12 August 1883. Her body is now in a museum. There are 23 Quagga specimens in museums, seven skeletons, and some skulls and other bones. A foundation in Africa is trying to bring Quaggas back to life by taking zebras that have very light stripes and breeding them. They began in 1987 and the first Quagga foal was born in 2005. ↑ Hack, M. A.; East, R.; Rubenstein, D. I. (2008). "Equus quagga quagga". IUCN Red List of Threatened Species. Version 2008. International Union for Conservation of Nature. Retrieved 5 January 2008. ↑ 2.0 2.1 2.2 2.3 2.4 2.5 2.6 2.7 "Recently Extinct Animals - Species Info - Quagga". petermaas.nl. 18 December 2008. Retrieved 20 August 2011. ↑ "The Quagga Project :: South Africa". quaggaproject.org. 2010. Retrieved 20 August 2011. This page was last changed on 5 April 2019, at 11:10.